San Francisco may be commonly associated with seafood because of its coastal location, but there’s more to the city than that. Unbeknownst to others, San Francisco can cook up a mean plate of chicken wings, from classic fried chicken wings to the stickiest Korean kind. 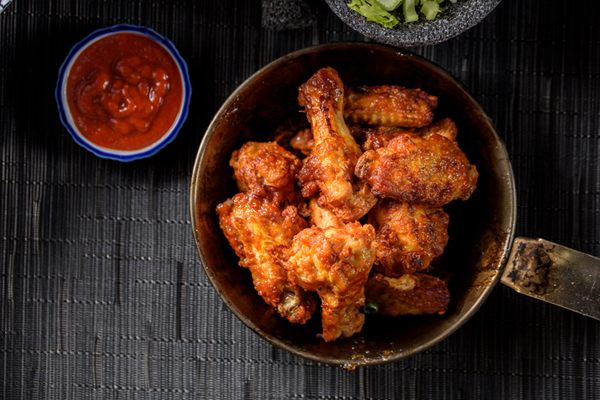 Hot Sauce and Panko To Go is everyone’s go-to shop for delicious chicken wings and fiery hot sauces. Order their wings and waffle combo in flavors like hot garlic bacon parmesan, habanero, gochujang, and teriyaki. As the name of the restaurant suggests, there is no dining area or waiter service in this hole-in-the-wall, just a few standing tables. Best, therefore, to grab your wings and go. Hailed as one of the best wings in San Francisco, Wing Wings definitely lives up to its name. Located in Lower Haight, the restaurant offers a mouthwatering array of fresh fried chicken wings with homemade sauces like Orange Miso, Angry Korean, and their signature flavor, Wing Wings. You can also have the chicken wings delivered right to your doorstep. Just call 415-835-5001 for delivery. The wings at Halal Wings Plus are beyond average. The restaurant uses halal meat, which is produce raised and slaughtered in a humane manner. The wings served come in honey garlic, mango habanero, lemon pepper, and chili lime. Depending on how much you and your party want to feast on, you can choose from a plate of 12 wings or go all out by ordering a plate of 50. Dig into the crispy and delicious Korean chicken wings of Odumak. This Korean-Sichuan restaurant serves up a variety of Korean fusion dishes like chicken bibimbap, beef bulgogi, kimchi fried rice, and 12 pieces of chicken wings in the flavor of your choice. Some of the most popular chicken wings flavors are soy garlic and hot and spicy. This is another great spot to go to for chicken wings. Located in between 9th and 10th Streets, Teeth SF is everyone’s favorite place for discounted wings. Every Wednesday, the restaurant offers its flavorful wings for 25 cents. Just make sure that you buy two beverages beforehand. If you and your friends want a relaxing night over beer and chicken wings, you’ve come to the right place. After Hours is a bar and lounge that serves buffalo chicken wings, Cajun meals, and beer on tap. Their saucy wings guarantee repeat visits. You’ll never get bored with the many ways San Francisco prepares its wings. Plus you’ll be amazed by the many world cuisines the city by the bay has to offer. Learn more about living in this vibrant city by giving Bernie and Mike Homes a call at 415 906 6000 or 415 308 4281.